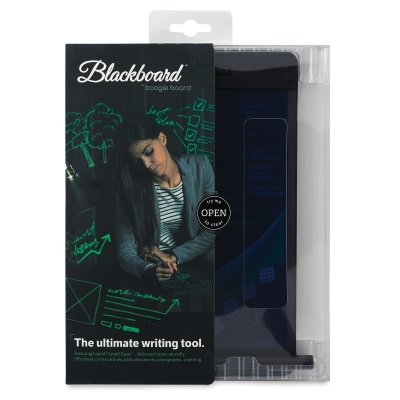 A new way to write, the Blackboard by Boogie Board is inkless pen on paperless paper! 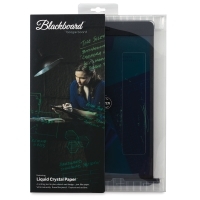 Great for creating and sharing designs, sketches, edits, schedules — even doodles — Blackboard incorporates Liquid Crystal Paper technology that makes writing and erasing as fluid as applying a pencil or pen to paper. 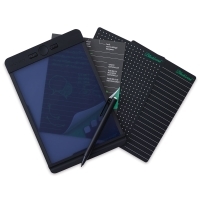 The semi-transparent screen makes it easy to write, draw, and trace on top of lines, grids, documents, or photographs. Erase with Exact-Erase technology, or clear the entire surface with the touch of a button. There's nothing to charge, plug in, or turn on. When you want to save, search, or share your work, Blackboard's free mobile app makes it possible. Blackboard by Boogie Board Includes four interchangeable templates, a five-year replaceable battery, and the free Blackboard mobile app. Blackboard, Note — This model measures 5½" × 7½" and includes Liquid Crystal Paper, Blackboard pen with Exact-Erase eraser, four templates (lines, dot grid, line grid, and black), and a pre-installed, replaceable five-year button-cell battery. 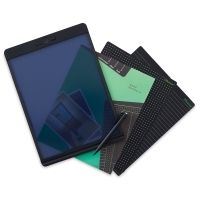 Blackboard, Letter — This model measures 8½" × 11" and includes Liquid Crystal Paper, Blackboard pen with Exact-Erase eraser, four templates (lines, dot grid, planner, and black), and a pre-installed, replaceable five-year button-cell battery. ™ Boogie Board is a trademark.™ Blackboard is a trademark. ™ Liquid Crystal Paper is a trademark. ™ Exact-Erase is a trademark.